Congressman Gaetz knows well the typical Florida election shenanigans that so often come out of Broward county. What was and is taking place before, during, and after, the 2018 Midterms is beyond anything he has witnessed before and he’s doing his best to warn Americans what that really means for 2020 and beyond. Congressman Matt Gaetz (R-FL) is alleging that Democrats in Florida are “stress testing the integrity” of the election system in an effort to build “a roadmap on how to steal” the 2020 race from President Donald Trump. Did You Know Only 7 Out Of 50 States Require Photo ID To Vote? It’s true. Just seven states out of fifty require people prove they are who they say they are when voting. Those seven states are Georgia, Indiana, Kansas, Mississippi, Tennessee, Virginia, and Wisconsin. Want to guess how many of those states Donald Trump won in 2016? SIX OUT OF SEVEN. The one (narrow)loss came in Virginia, a true swing state. One has to wonder why Democrats are so opposed to voter ID laws. Don’t they want true and legitimate elections? Don’t they want to prevent rampant voter fraud? Seems lots of ballots were suddenly being discovered in Arizona as radical Code Pink Democrat Kyrsten Sinema, who was trailing Republican Martha McSally after the polls closed, has suddenly taken the lead two days after the polls closed. Weird how Democrats always seem to be the ones to find ‘missing/uncounted’ ballots in close races. It’s also weird how a state that President Trump won comfortably in 2016 would then vote in 2018 for a radical, anti-American activist over a former Air Force fighter pilot. That’s some very odd math. Democratic candidate Kyrsten Sinema took the lead in the Arizona Senate race in new numbers released by the state Thursday night, flipping the race from what had appeared to be a GOP hold. Republican Martha McSally led the vote after the polls closed Tuesday, but hundreds of thousands of ballots were still uncounted, officials said. As the count comes in, Ms. Sinema has overcome a sizable gap. The latest numbers give her 914,243 votes to Ms. McSally’s 912,137. Earlier in the day, the tally had stood at 856,848 for Ms. McSally and 839,775 for Ms. Sinema. That is quite a shift in the voting tally – especially two days after the polls closed. In the weeks leading up to Midterm Election Arizona was among a handful of states where voter fraud abuse was considered a primary concern. Interestingly, those same concerns were also voiced in Florida where yet more Democrat votes are now being “found” as well. 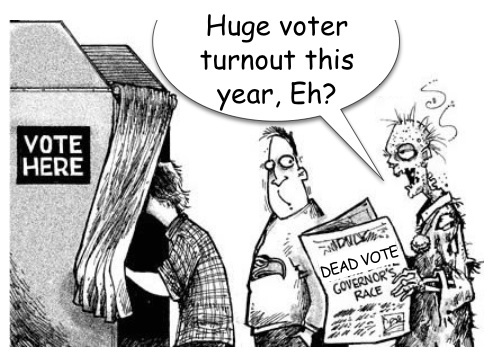 If the ‘finding lots of Democrat ballots’ trend holds it appears Arizona will be a Senate pickup for Democrats, leading some to believe the Democrat Machine’s typical voter fraud machine has been kicked up a notch following their stunning presidential defeat in 2016.